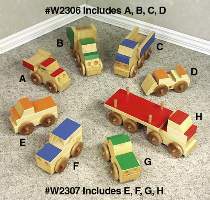 Made using standard "2x4" and "1x4" stock, these toys are easy to make and are almost indestructible. Ideal for outside play and day care centers. No small attachments to fall off, even the headlights are drilled into the wood. Order both plans to build all of the toys pictured. Plans for all projects are drawn FULL SIZE. Order twenty axle pegs and twenty wheels for each plan set, or see Special Offer which includes both plans, 40 wheels and 40 axles.